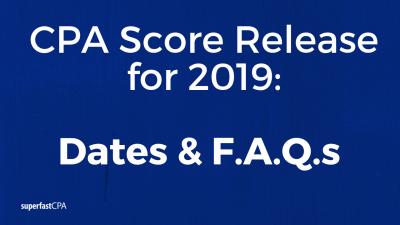 On this page you’ll find the CPA score release dates for 2019, links to check your scores depending on your state, additional information, and frequently asked questions about CPA exam scores. Have you wondered HOW the CPA exams are scored? Or, what the “higher order skills” from the AICPA blueprints actually mean? Or what types of questions apply to each skill type? Also, did you know the AICPA blueprints contain some very helpful information on each section, so you can better prepare? All that is on this page as well… just use the table to contents below to find what you’re looking for. What is a Passing Score on the CPA Exams? What time of day are CPA exam scores released? CPA Score Release: Who scores the CPA exams? What are the different "skills" from the AICPA CPA exam blueprints really testing? What question types do the blueprint "skills" apply to? How is the AUD CPA exam graded? How is the BEC CPA exam graded? How is the FAR CPA exam graded? How is the REG CPA exam graded? What are "pretest" questions on the CPA exams? CPA Score Release: How are the CPA exams graded? Why is my performance compared to people who scored 75 to 80? Are CPA exam scores curved? When do CPA exam scores expire? CPA Score Release: Are CPA exam scores released early? What is the highest possible score on the CPA exams? Has anyone got a perfect score on the CPA exams? What is the Elijah Watt Sells award? Bonus for Getting the Elijah Watt Sells award? Note: According to NASBA, if BEC is the section you’re waiting on, your CPA score release could be up to a week after the target dates above due to the additional analysis that may be required to grade the written communication tasks. Depending on the state you’re testing under, you’ll either check your CPA score release on NASBA’s site or on your state board’s site. Here’s the link again to check a NASBA score…. A passing score is a 75 or above on any section. The scores are on a scale of 0 to 99. The sections are Auditing (AUD), Business Environment and Concepts (BEC), Financial Accounting and Reporting (FAR), and Regulation (REG). All sections contain both multiple choice questions (MCQs) and task-based simulations (TBSs or "SIMs"), while BEC also includes three writing portions known as "written communication" tasks. MCQs are organized into testlets - a group of questions - and each testlet is either "medium" or "difficult". Each candidate starts with a medium testlet, and if they do well on a medium, then they are given a difficult testlet. If the candidate does not perform well on the first testlet, they are given a second medium testlet. The task-based simulations give the candidate case study information and the candidate needs to draw conclusions, perform journal entries, or calculate balances from the source material, which demonstrates the candidate's "higher order skills" compared to just answering multiple choice questions. The TBSs that a candidate receives on test day are pre-assigned and do not vary based on the results of the first testlet like the MCQs. The written communications on BEC require the candidate to write a brief response to a prompt based on different business topics. A CPA score release from NASBA will sometimes be posted a day early, if they are released on the actual release day then they can show up at 1am, all the way into the afternoon. So the answer is, it depends. You will end up pressing the button on the score release site hundreds if not thousands of times. A few of mine were posted early in the morning on release day, while my BEC score was posted late afternoon on release day. Remember that BEC is the only exam that requires any manual grading, so a BEC score can hours or even a day later or more than the target release date. Scoring the MCQs and the TBSs is an automated process. Written communication responses on the BEC section are also mostly graded by a computer program that is calibrated by human scorers. In some cases the responses are graded by a group of human scorers that are all CPAs. If your score on BEC is close and comes down to the written responses, then your written responses will be re-graded by human scorers. As you read through the CPA exam blueprints and see the breakdown of skills tested based on the topic, you might wonder "Does that mean it will be tested through MCQs or TBSs?" The "Remembering and Understanding" skill is only tested through MCQs. The "Application" skill can be tested either by a MCQ or a TBS. The "Analysis" and "Evaluation" skills will only be tested through a TBS. Remember that "Evaluation" only applies to the AUD section. The AUD exam features 72 MCQs, and 8 TBSs. You have 4 hours to complete it. The AUD CPA exam is considered by most to be "easier" than FAR or REG, but if you haven't worked in auditing, it can be a very tough exam. Many candidates have saved audit for last and then failed it several times. The reason AUD can be so tough is that so much of the material sounds really similar but has very distinct and different meanings and application, and that the process of an audit is relatively complicated and has a lot of nuances. Based on the cumulative pass rates for 2017, AUD comes in right at 3rd place (3rd hardest) with an overall pass rate of 48.59%. The AUD exam is the only CPA exam that involves the "Evaluation" higher order skill from the AICPA blueprints. "Remembering and Understanding" is mostly concentrated in Area I: Ethics, Professional Responsibilities, and General Principles, and Area IV: Forming Conclusions and Reporting. "Application" is tested through all 4 of the AUD areas. "Analysis" and "Evaluation" are primarily tested in Area II: Assessing Risk and Developing a Planned Response and Area III: Performing Further Audit Procedures and Obtaining Evidence. This makes sense since this part of an audit is where the auditor is performing tests and evaluating audit evidence. You should note that these two areas are also the most heavily tested, with area II making up 20-30% of the exam, and area III making up 30-40%. The BEC exam features 62 MCQs, 4 TBSs, and 3 writing tasks. It's the only CPA exam that involves a writing portion. You have 4 hours to complete it. The BEC exam is considered to be the "easiest" CPA exam, and the overall pass rates support that, with BEC having an overall pass rate of 53% throughout 2017. "Remembering and Understanding" is tested in all five areas of BEC. "Application" is also tested in all five areas of BEC, which means the TBSs you could see could be from any area. "Analysis" is tested in Area II: Economic Concepts and Analysis, Area III: Financial Management, and Area V: Operations Management. This could include comparing investment alternatives using financial metrics or ratios, financial modeling, forecasting or projections, etc. The FAR exam features 66 MCQs, and 8 TBSs. You have 4 hours to complete it. The FAR exam is considered to be the hardest CPA exam, and the overall pass rates from 2017 support that, with FAR having the lowest overall pass rate of 44%. "Remembering and Understanding" is tested through all four areas of FAR, with the highest concentration being in Area IV: State and Local Governments. "Application" is tested in all four areas of FAR, which will frequently be dealing with journal entries and financial statements. "Analysis" is tested in Area I: Conceptual Framework, Area II: Select Financial Statement Accounts, and Area III: Select Transactions, such as reconciling account balances, interpreting agreements, and detecting reporting discrepancies. The REG exam is definitely one of the hardest CPA exams - FAR and REG are clearly more difficult than BEC & AUD - the 2017 pass rate for REG was 47%. REG tests your knowledge of business law and the internal revenue code, so needless to say, it's a tough exam. "Remembering and Understanding" is mainly tested in Area I: Ethics, Professional Responsibilities, and Federal Tax Procedures, and Area II: Business Law. You'll notice in the table above that "Remembering and Understanding" makes up a large portion of REG (25-35%), so that should be a small sense of relief that you just need to know the facts from Areas I & II. "Application" and "Analysis" are tested in Area III: Federal Taxation of Property Transactions, Area IV: Federal Taxation of Individuals, and Area V: Federal Taxation of Entities. Pretest questions are questions that are being "tested" live on the CPA exams by candidates, but they aren't counted towards your final score. These questions or simulations are undetectable to the candidate taking the exam: you won't know which questions are graded and which questions or simulations are pretest questions. This is a way for the AICPA to "battle test" a question or simulation before making it an official graded question. If a pretest question meets certain statistical criteria after undergoing the pretest period, then the question will become a regular graded question for the exams. Each CPA exam section will contain 12 pretest MCQs, and 1 pretest task-based simulation. On BEC, 1 out of the 3 written tasks will be a pretest task. The CPA exams are scored using Item Response Theory, or IRT. IRT uses three statistical measurements to assign a weighted value to a question. Difficulty: is the question easier or more difficult for most candidates? Discrimination: to what degree does the questions differentiate between more able and less able candidates? Guessing: How likely is the candidate to get the right answer just from guessing? These attributes of a question are evaluated during the "pretest" phase of the question, and if the question fits the requirements as it goes through the pretest phase, it becomes a scored question or simulation. From there, the "grading" of the MCQs and simulations is automated. For the written communication portion of BEC, some of the responses are graded using an automatic process, and some are graded by a panel of human graders, which are all CPAs. In addition to your numerical score, you will receive a "candidate performance report". Your numeric score is calculated using the Item Response Theory scoring (mentioned above) and is obviously displays your score as a whole. The candidate performance report is where you'll receive a breakdown of your performance by content area, and then by item type, meaning multiple choice and simulation (and written communication on BEC). Your report will be marked in the corresponding areas whether you scored "weaker", "comparable", or "stronger" compared to passing candidates who scored between 75 and 80 on that section. According to the AICPA's site, the purpose of the performance report is to give you a gauge of how to compared to candidates that "just passed", meaning people who scored between 75 and 80. The performance scale is based on a range of one-half of a standard deviation above and below the average score of candidates who scored between 75 and 80. So if you scored within the comparable range on a given content area, then your performance report will be marked "comparable", if you scored below the range, it will be marked "weaker", and if you scored above that range, it will be marked "stronger". The portion that shows how you did on the MCQs vs how you did on the simulations is valuable information in case you failed the section. Also, if you failed the section, don't make the mistake of only studying the sections that you scored "weaker" on. Obviously you'll want to spend time on those areas, but you should keep reviewing practice questions from all topics as you prepare for your retake. There's so much information to cover, that even a few weeks off from specific topics is long enough to forget rules, formulas, etc. CPA exam scores are not curved. Each candidate's score is independent of other candidates' scores. Hypothetically, all CPA candidates could pass the exams in a given window as long as each one scored a 75 or above. When you pass your first section, you have a "rolling" 18 months to pass the other 3 exam sections. In general, that means that it's 18 months from the date you took the first exam that you passed. It's not 18 months from the CPA score release when you found out you passed... it's 18 months from the date you took the first exam that you passed. 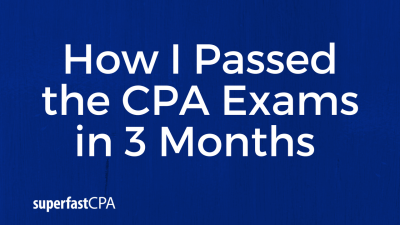 So, if you sat and took FAR on January 1st, 2019 and found out you passed it, you would have until June of 2020 to pass the other 3 CPA exam sections. 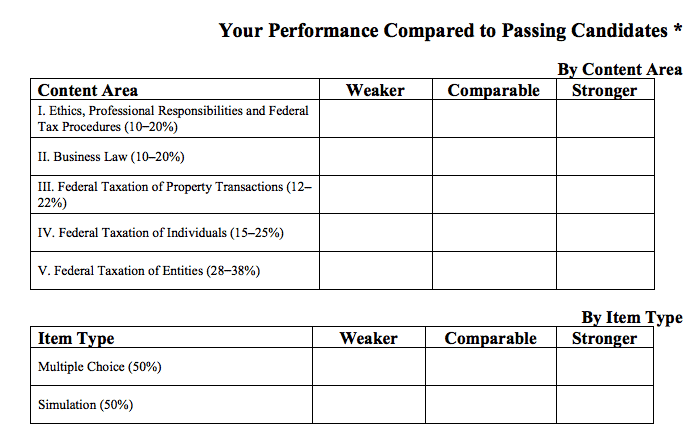 If you score a 74 at the next CPA score release and you really feel like you probably got a 75, can you appeal your score? There are actually two "options". There's a "score review", and an "appeal." A score review is a service that the AICPA will perform where they provide additional assurance that operational quality controls in the scoring process were complete and that your score is accurate. All reported scores are subject to routine quality controls, and each exam - according to the AICPA's scoring FAQs - are actually scored twice before they are reported to your state's Board of Accountancy. The AICPA also notes that less than 1% of all score reviews result in a score change, so it's generally not recommended to request one (waste of time and money). If you score a 74, you should just accept your fate and start restudying. I in fact scored a 74 on my first attempt at FAR, and subsequently read all about appealing or getting a score review. An appeal on the other hand allows you to review your incorrect responses to MCQs and/or simulations and to also view their responses, and then you submit comments to challenge the answer or defend your position. If you decide to do so, you must be prepared to present a "cogent, vigorous, and compelling defense of your incorrect responses." Also, the appeal must take place in an authorized location, under highly secure conditions, and in the presence of a representative of your Board of Accountancy or its designee. So... it's pretty serious event. According to NASBA's site, score appeals are NOT permitted for the following jurisdictions: California, District of Columbia, Colorado, Georgia, Illinois, Montana, Ohio, Texas, and Virginia. You can read more on this from the AICPA here, or NASBA here. For each CPA score release, it's not very likely that CPA exam scores will be released several days or a week early, but it's pretty common for scores to show up on NASBA's site a day before the target date. Again, if BEC is the section you're waiting for, don't count on seeing your score a day early (you'll probably see it a day after the target date), but for AUD, FAR, or REG, feel free to start checking the day before the target CPA score release. The highest possible score on the CPA exams is a 99. A passing score is any score from 75 to 99, and the exams are graded on a scale of 0 to 99. However, this is not a percentage score and can't be understood as a percentage. The scores on the AUD, FAR, and REG exams are weighted scores calculated from the scores from the MCQs and TBSs. The BEC score is a weighted calculation from the scores on the MCQs, TBSs, and the written tasks. The "weighted" score refers to whether a question or simulation was answered correctly and the relative difficulty of each question and simulation. Since the highest score on the CPA exams is a 99, numerous people over the years have scored a 99. It's rumored that there's several CPA unicorns out there that have scored a 99 on all 4 sections, but I definitely don't know anyone personally who has even come close to that. 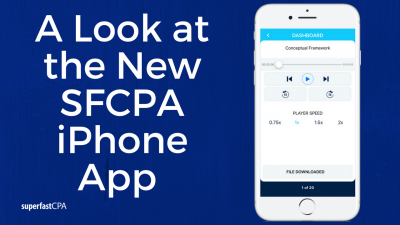 If you get a 99 on the next CPA score release, let us know. The Elijah Watt Sells award is given to CPA candidates that score a cumulative average of 95.5 across all 4 CPA exams, and pass each section on their first attempt. Needless to say, this is not easy to do. For example, in 2016, out of the 102,323 people that sat for the CPA exams, only 58 met the criteria to receive the award. That's 0.06% of all people who took the exams, or about 1 out of every 1,754 candidates. There are rumors that the big 4 award a bonus of $10,000 to $20,000 for getting the Elijah Watt Sells award. The most consistent "rumor" that we found online says that PWC pays a bonus of $20,000 for getting the award, on top of the bonus for just passing the CPA exams. If you win the award and get a huge bonus, let us know. There are two review courses that I think are far and away better than other options. Roger is known for his very high-energy lectures, which make otherwise pretty boring topics easier to pay attention to. This is the review course I used, and it covers the information very well, and the big, big thing: They let you keep access until you pass. Other big-name review courses do not offer that.